As the end of 2011 fast approaches, waves of year-end reviews have been circulating the travel blog community. There have been countless adventures by hundreds of travel bloggers, each special and unique in their own way. But there were a few adventures that stood out from the rest (at least in our minds). We’ve highlighted 19 epic adventures taken by travel bloggers during the past year. 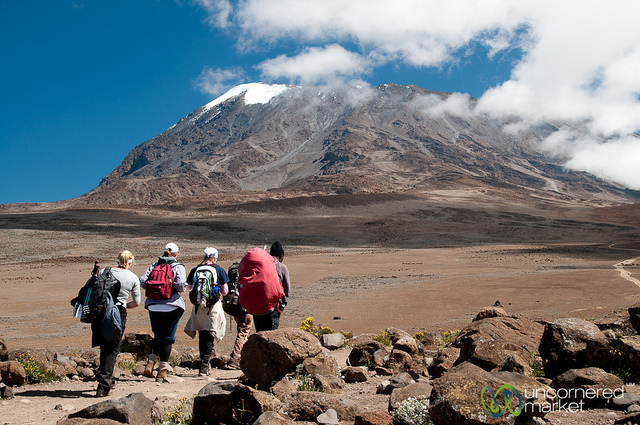 Perhaps one of these adventures will inspire your travels in 2012! 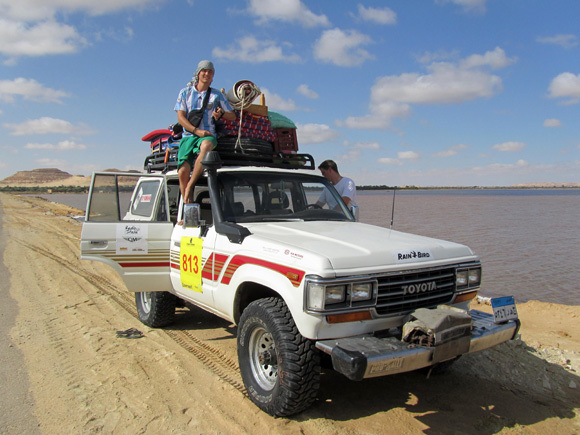 Dave and Deb of The Planet D, Rick Griffin of Midlife Road Trip and Sherry Ott of Ottsworld formed the Social Media Syndicate and took on one of the most epic travel blogger adventures of 2011, the Mongol Rally. 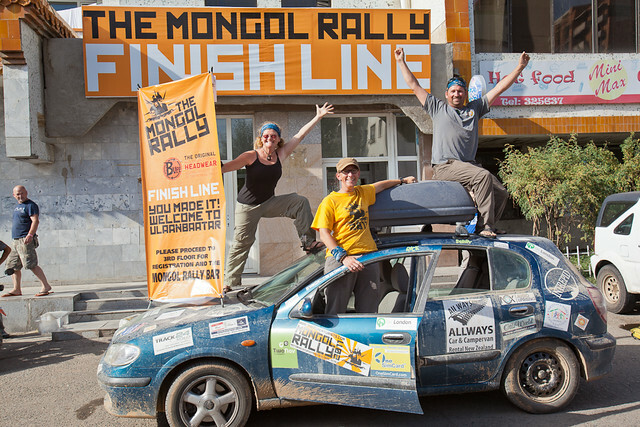 For those unfamiliar, the Mongol Rally is an unsupported road rally from London, England to Ulaan Baatar, Mongolia, crossing 15 Countries and over 9,000 miles (14,500 km). Read more about the adventure here. Michael of Go, See, Write, Nora of The Professional Hobo and Jeannie of Nomadic Chick took on the Ultimate Train Challenge, a 30-day train only journey from Lisbon, Portugal to Saigon, Vietnam. Find out who won the challenge here. Okay, perhaps being shipwrecked is not the best way to experience Indonesia, but it did make for a heart stopping adventure that Kate, from Adventurous Kate, will not soon forget. Read about the surreal, and potentially deadly, experience here. Marcello of Wandering Trader has been on countless adventures in 2011, so it was difficult to choose just one. Aside from feeding a hyena with his mouth in Ethiopia, one of the coolest things he did in Africa was walk with a group of cheetahs. Ayngelina of Bacon is Magic was involved in one of the most unique adventures of 2011, snorkeling in the extremely frigid waters of Northern Canada in search of beluga whales. Yes, you heard me correctly – beluga whales! Read more about this rare adventure here. Craig from y Travel Blog had the amazing opportunity to attend the Great Crusade tour of New Zealand, an ultimate supporters tour that followed Australia’s Rugby team, the Qantas Wallabies, at the 2011 Rugby World Cup in New Zealand. Read more about his epic adventure here. Dan and Audrey from Uncornered Market strapped on their hiking boots and partnered with GAP Adventures to tackle Africa’s highest peak, trekking to Mount Kilimanjaro’s summit. Read about their rewarding adventure here. Sophia and Nathan from As We Travel took the challenge and visited 30 European countries in only 90 days, quite the accomplishment! They did a great job filming their European adventure and put together a fun mini-series of videos. Watch their videos here. Sticking with the theme of trains and Europe, Pete and Dalene from Hecktic Travels took a break from house sitting to travel from Croatia to Italy with a sponsored rail pass from EuRail. Being Canadians that love hockey, we were happy to see that they attended a professional hockey game in Slovenia. Nellie of Wild Junket experienced one of our world’s most unique islands. 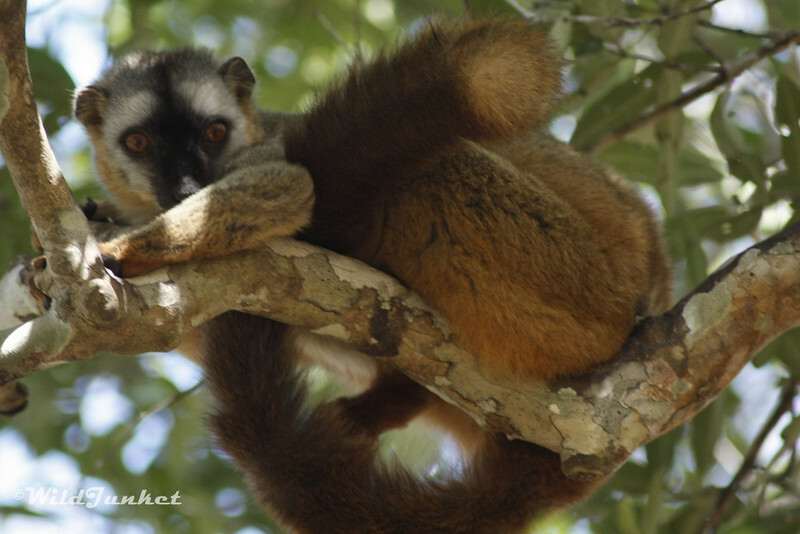 Located off the southeast coast of Africa, Madagascar is the only place on earth to find lemurs, chameleons and ferocious fosas, as well as bizarre-looking baobab trees and spiny forests. Read about her wild adventure here. Dave from Go Backpacking cruised the Galapagos Islands in 2011, an epic adventure that included swimming with sea lions and hiking Martian landscapes. He put together a guide to booking a last minute cruise to the Galapagos Islands so that other backpackers can experience the wonder of the Galapagos. Earl from Wandering Earl partnered with Eurail in September and traveled from Zurich to Transylvania, discovering the ruins of war in Bosnia and Herzegovina and falling in love in Ljubljana. Read more about his adventure here. 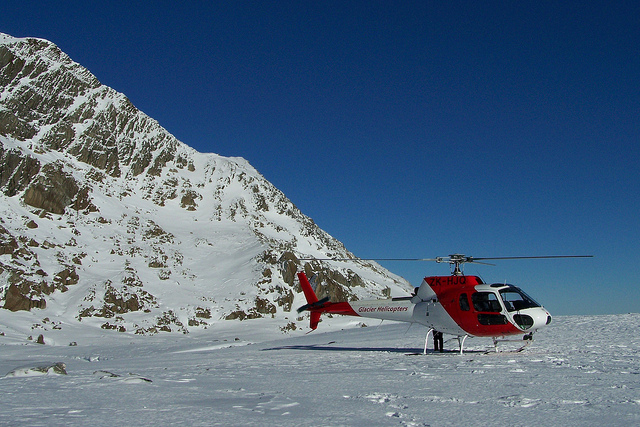 Matt from Landlopers had a real life IMAX experience when he flew over Mount Cook and Franz Joseph Glacier in a helicopter, touching down on the snowy glacier (we had a similar experience in Queenstown). Check out his awesome video footage here. Amanda from A Dangerous Business spent her summer road tripping across the United States, traveling more than 6,500 miles across a dozen states, including the Grand Canyon, Monument Valley and the Cadillac Ranch. Ant and Elise of Positive World Travel jumped on a motorbike and traveled from the North to the South of Vietnam, covering over 3,500km in two months. They enjoyed the adventure so much they even wrote a book about it! Read about their adventure here. Mark from Migrationology had an incredible time touring the giant sand dunes and rugged landscapes of Western Egypt in the back of a speeding land cruiser. Check out his fantastic collection of photos here. John and Andrea of Inspiring Travellers spent a week trekking through the spectacular landscapes of Torres del Paine in Patagonia, including a boat trip to see the stunning blue ice of Grey Glacier. Read more about their adventure here. Brendan from Brendan’s Adventures fulfilled a lifelong dream earlier this year, photographing the raw natural beauty that is Antarctica. 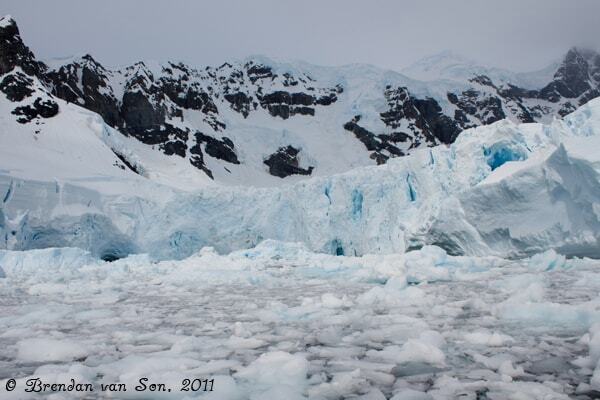 The crazy Canadian even took the plunge and went swimming in the frigid Antarctica waters. Watch a video of his adventure here. Talk about an EPIC adventure! The Vogel family bicycled from Alaska to Argentina, cycling 17,300 miles in nearly three years, reaching the southernmost tip of South America in March 2011. Davy and Daryl now hold the world record as the youngest people to cycle the Pan-American Highway. Read more about their adventure here. What was your Epic Adventure of 2011? Share your experience in the comments section below. Feel free to leave links, we’d love to read about it! 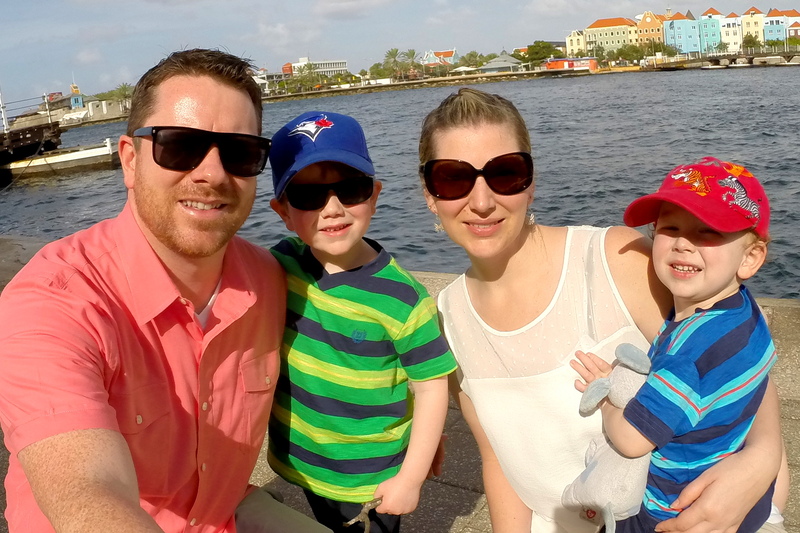 Thanks Kirsten – glad you found some inspiration through these great travel bloggers! Thanks for including us! Our journey was incredible and one we won’t soon forget. I had never heard of a couple of the adventures in your list – I’m off to start reading! Great round up and lots of inspiration here. We’d love to motorbike around Vietnam in particular. We just completed our first multi-day motorbike trip from Chiang Mai to Burma for a visa run. It was exhausting and exhilarating and we are now hooked! That’s sounds like a great adventure! We love that part of the world and hope to get back there sooner than later. Do you have any future motorbike trips in the works? Woah.. those are some mighty epic adventures!! So inspiring.. and thanks for sharing. Likely our biggest epic adventure this year was selling our 17′ home on wheels, taking a complete leap of faith in serendipity in becoming homeless backpackers, buying a 30-day rail pass on Amtrak and traveling all over the USA in search of a vintage bus to become our new home on wheels to continue on in our 5+ years of life on the road. Just checked out your story… what an incredible ride you guys are having! Lots of inspiration for 2012 – great post! What was your Epic adventure for 2011? Wishing you both a wonderful New Year!! Thanks Earl – all the best to you in 2012! Drew (AlmostFearless’s husband) and I did all of India by train in two weeks. Also, Todd and Lauern (from Globetrooper.com) were there was well. Ah, yes! I forgot about this one T-Roy! My bad. We’ve enjoyed following your Euro-trip! My epic experience in 2011 was definitely witnessing the Egyptian Revolution. I had countless trips all over its deserts and seas and cities both before and after the Revolution and I will always remember about every single emotion that amazing Country gave me, including REAL fear and REAL excitement for living history in the making. I love Egypt. Wow – that must have been an incredible experience! I can’t image the feeling of the city and its people during such a volatile and liberating time. Feel free to share a link to an article if you have it, we’d love to read about your experience. Awesome! Thanks for sharing Megan. We’re heading over now to read about your adventures. Maybe it is because it is the most recent, but I have to say spending a week in Puerto Madryn and getting really close to penguins, elephant seals, and whales has been my epic wildlife adventure for 2011. In 2012, I’ll be following in the Inspiring Travellers footsteps and trekking Torres del Paine. I plan to do the full circuit in 7 days and camping the whole time..
I’ve heard that the wildlife in Puerto Madryn is quite amazing. Definitely sounds like a fantastic adventure, as does trekking the Torres de Paine in Chile. Hey guys. Thanks for the mention! Looks like lots of adventures were had in 2011. Can’t wait to see what 2012 has in store! Happy New YEar! Thanks so much for including me in this, my experience with beluga whales was incredible but I feel like I need to catch up on everyone for more inspiration. I had never even heard of snorkeling in Manitoba, let alone with beluga whales! Thanks Craig – all the best to you and your family in 2012! Couldn’t agree with you more Dave. Reading the adventures of travel bloggers always inspires our future travel plans! These are all wonderful adventures…except one, which I really have to disagree with. I don’t think that 30 European countries in only 90 days is an accomplishment. I would rather a blogger visited less places and stayed longer there so his or her blog posts could provide more insight into each location, rather than just whizzing through lots of them in an attempt to complete a silly challenge …just my two cents. Thanks for sharing your feedback Denise! I actually think the challenge is a great idea, but appreciate your position. Having been to many of Europe’s countries already (as have the bloggers involved in the challenge), I like the idea of the adventure being more about the train itinerary and the journey than the actual destination. But everyone travels for different reasons. WOW! I had missed some of those… Glad I got to catch up! We look forward to following your travels in 2012 Abby! What an inspirational post! While my adventure was epic to me after being locked in a cubicle for the last 10yrs it was the propane fire I survived that maked it all the more personally rewarding. I now have a new van and will be continuing my journey towards Savannah, ga after I recharge my batteries and relax for a second. My next post contains a surprise that makes pt 2 awesome. Thanks to all the bloggers that blazed the trail! Thanks for stopping by ans sharing your story Brian! I love this post! How inspiring. When you see all these adventures lined up it looks super impressive, and knowing that many of these were just one example of the many adventures taken by travel bloggers makes it even more inspirational! Isn’t that the truth Laura?! Man, I am so jealous and inspired. Now I know why I don’t have a bucket list, it would never end! Great Post! And Great Adventures. Thanks! That’s the funny thing about bucket lists, as soon as something gets crossed off another one replaces it. Thanks for stopping by Justin! What was your epic adventure of 2011? What are your big plans for 2012? Great list of adventures that really do span the globe! Ah yes, the College Football Tour! My apologies Jeremy, I hadn’t read any posts about your trips? Did I fall asleep at the wheel?! Back in October, I started a series called the College Football Travel Tour. The idea behind the series was to attend college football games, share my experiences and feature interesting stories from the game. However, this series is also as much about travel as it is football. As I visit each of these college towns, I tell people about the campus and do unique stories on the school and students. I find activities for people to do, places to eat, and places to stay while giving people travel tips and interesting features on the towns. Whether people love travel, football, or both, I want to share the unique local culture that is a part of of these college towns and cities. This year, I went to the University of Washington, University of South Carolina, and the Naval Academy. I reviewed 15 hotels, 13 restaurants, and countless other activities. I’ve got over 100 pages of notes, 4 hours of videos, and nearly 2,000 photos from the three schools I did this year. I talked to former football players, sports writers and authors, radio hosts, students, restaurant and hotel owners, fans, and people from all walks of life in this series. You can see the series on my site as I have a link for the College Football Travel Tour on the sidebar and menu. As part of this series, I work closely with the schools and tourist boards in each location. I am already planning my stops for next year and have a number of features and posts for the schools that I did this past year coming in 2012. I’ve gotten a great response and a lot of interest in the project so far and this is only going to get bigger. Wow, all these adventures have me itching to travel – looking forward to another round in 2012! This year, 2011, wasn’t a big one for me in terms of travel adventures … but I did go on my first tiger safari (at Ranthambhore tiger reserve in Rajasthan, India) and I finally made it to Bhutan. I would like to say that I hiked all the way up to Tiger’s Nest monastery, but I had altitude sickness and only made it half way (to the lookout cafe). Just means I have to go back! Wow – Bhutan is such a mysterious destination. Not too many people get to have that experience, so I would definitely feel proud about that achievement! Wishing you continued success in 2012 Mariellen! My epic travels of the year included a 35-day road trip through 19 U.S. states and two Canadian provinces across three time zones. My husband had never been to the East Coast before, so that was of particular interest to us. Highlights included following the Freedom Trail in Boston and exploring Washington D.C. during the Folk Life Festival, where the 50th anniversary of the Peace Corps was celebrated. Though I didn’t visit any new states on the trip, one of the new things I did on the trip was visit Niagara Falls. My epic adventure was definitely travelling India by train – what an experience! Ah, yes. The good old Indian Rail. That is definitely an adventure! Wow, just wow. I’m totally inspired by the 19 adventures. It’s amazing to me to learn what unusual opportunities and experiences are out there if you just look. Thanks for posting! It wasn’t exactly epic compared to these adventures, but we sure had a great time…My dear friend Jenn & I left our husbands at home and took our combined 11 kids on a cross-country trip. 8 weeks from East Coast to West Coast and back again. Wow! I’d say that traveling coast to coast with 11 kids is epic! It’s hard to pick just one, we saw so many fantastic State and National Parks including Mt. Rushmore, Yellowstone, Crater Lake, The Redwoods, Yosemite, Grand Canyon & Carlsbad Caverns among others. For me personally though the highlight of the trip was spending time with my 95yo Grandma and introducing her to 2 of my children that she hadn’t met. She passed away yesterday and I’m SO thankful we took the trip when we did. For anyone out there contemplating a big trip, take the plunge! Especially if it involves spending time with those you love, you’ll never regret going, but if you put it off too long, you might miss out. Even though I’ve had some wonderful adventures this year – hiking the Tour du Mont Blanc with my daughter, kayaking Lake Superior and hiking in Chile on a 2 1/2 week trip to the area, I still feel like there’s so much to do and my adventures don’t even come close to some of the other bloggers. Look out 2012 – I have remote adventures planned off the beaten path – kayaking in Tweedsmuir Provincial Park and lots of backpacking in the Rockies and Waterton National Park. Nice rundown on what the others are doing. Wow! Thanks guys for including us in your epic adventures round up! Reading over this list, just makes our own bucket list keep on getting bigger! I love getting inspired by other travellers and what we can do in this amazing world! Thanks for writing this and here’s to more adventures in 2012! Hey Elise, 2011 has been epic indeed! Thanks for compiling this! this just gave me more ideas for the future! Happy New Year! Hey great list. Thanks for the ideas. On theme with the Great American Road trip above how about a Canadian road trip? Really inspirational list. So many adventures that I’d like to do one day. What an amazing collection of adventures. Very inspiring.. I want to go on all of them! Great list! So many travel adventures to be had out in the world. Hey Kim! You have a big year of adventure on the horizon… what are you most looking forward too?! Thanks for sharing your adventures Karl, heading over to your links right now…. Wow, what a list! Some awesome adventures this year – and thanks for including my road trip here! I saw swimming with beluga whales on a yahoo list and then on here. I have to do it! We did Tuscany, Venice, Ravenna, Bern, Munich, Amsterdam, Colmar, Strasbourg, Antwerp, Brugge, Normandy, Loire Valley, Ardeche by train, plane and automobile, blogging about adventures and food all the way. Fun times, hopefully many more to come in 2012. It wasn’t quite as epic as others, but we did love our trip up the and down the East Coast of Queensland, Australia. That’s a great part of the world – what was your favourite moment? Thanks for compiling this list! Great inspiration for travel adventures in 2012. I had read bits and pieces of some of these, but it’s nice having them all listed here together to show just how many great adventures are out there just waiting to be had. Ours starts in September…. Awesome – we look forward to hearing about your upcoming adventure. What are you most excited about?! That’s quite the trip! What was your highlight? Fun list! One of my favorite year end reviews I’ve seen for 2011. Enjoyed remembering reading many of these blog stories and some new ones I’d yet to discover. Epic adventures for me were two last minute surprise trips to San Francisco and SoCal. Also, increased my list of countries visited to 9 without a single stamp in my passport yet! Thanks Cat – glad you like the post! Well, it’s not really as exciting as it sounds but by going on cruises. I’ve never flown or drove to another country so it’s all islands and countries reached by ship in and around the Caribbean. Instead of being disappointed I have no stamps yet, I think it’s kinda neat that I’ve been to that many countries with a still blank passport! I managed to have a pretty wild 2011: 21 countries, 66 flights and 125,978 miles of eating my way around the world! I crashed a wedding in Bangalore, sailed alongside blue whales near Cape Verde, shared a meal with a family in Dakar, volunteered at a school in Ethiopia, harvested olives in Tuscany, skied the Alps, climbed volcanos from Guatemala to the Canary Islands, dove in Honduras and went on a herring binge in Scandinavia. Here’s to 2012 and all of the food-filled adventures it will bring us!! Wow – sounds like an epic year indeed! Great to see so many great travel site publishers doing so many great things, inspiring and promises exciting things for the future of us all. It definitely fuels the fire! Great post! I hope The Happiness Plunge will make the cut next year! Happy New Year! Thanks Adam – what do you have planned for 2012? What a fabulous list of adventures! Love reading the inspiring stuff people are doing all over the world. We just finished our 2nd year on the road….8,000 miles and 62 stops and plan to keep going. Thanks for sharing your adventures Nina! Cairo to Nairobi! The great Adrican overland adventure! Wow – sounds fantastic! What was your highlight? 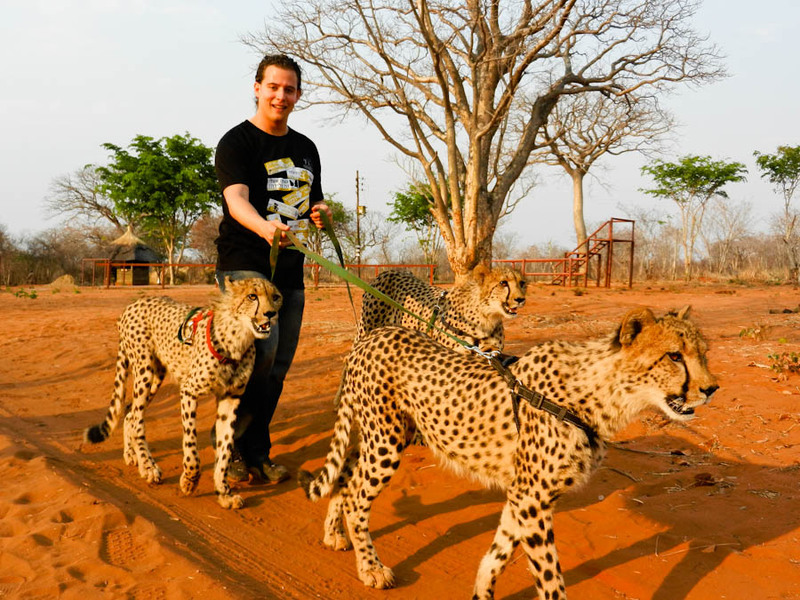 Wow – what killer adventures – walking with cheetahs??!! Seriously??! A 35 day walk across Spain sounds like an amazing accomplishment. Why don’t you leave a link so that our readers can check it out! Great list! I think my epic adventure of 2011 was spending two weeks in Nepal meeting the locals. It’s been a lifelong dream. the european rail sounds awesome! Indeed – we hope to visit Europe again this summer. I can’t get enough of Europe – love it! I loved these, and had a great time reading those that I missed. Ayngelina and the beluga whales was especially incredible! The Mongol Rally is something I’m also interested in doing someday, it looks like such a trip. Thanks for sharing! Glad you enjoyed the post Dayna – there was certainly a lot of amazing adventures to be had in 2011! Bali to Timor Leste on a motorbike with my son, probably. Or Adelaide to Alice Springs and back in a car… One of the two. Both sound like awesome adventures! Wow! These adventures really are epic. I didn’t scale any glaciers in 2011 but I enjoyed visiting Cairo a few months after the revolution and experiencing the optimism and national pride there. I will never forget that trip! My epic adventure was a 6,000-mile, 13-state road trip of the Western United States, followed by a 2,500-mile cross-country move, followed by a four-month world circumnavigation by ship with Semester at Sea! Wow – these are impressive! Have cycled across Canada – I would love to do North-South America top to bottom! There is also a North-South Africa trip that would be amazing! Unforgettable! Inspiring list!